Get the source from here! 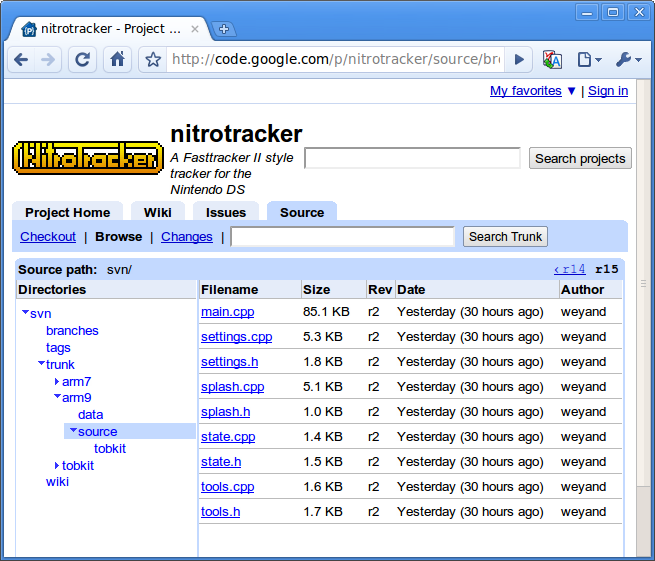 I'm very excited to announce that NitroTracker is now completely open source! What does this mean? Well, for starters you can now have a look at the source code. More importantly, you can now help develop it! Together we can make the development of NitroTracker go faster (which would be a very good thing considering current development speed) and finally add long-awaited features I promised ages ago. 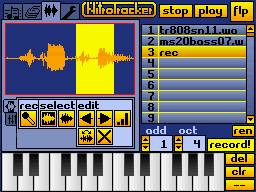 Despite some minor improvements, NitroTracker is still at version 0.4. By joining forces, I'm sure we can make this 1.0 in no time! Wanna join the fun? Check out the source and start hacking! For more info on how to set up the environment, have a look at the getting started guide. The site r4revolutionds.co.uk is running a poll to determine the top-10 DS homebrew apps / games of all time (up till now, that is). If you think NitroTracker should be on that list, vote here! Finally! 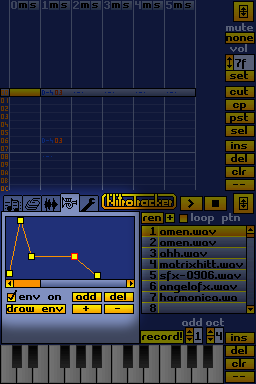 NitroTracker v0.4 is here! I've been distracted a bit by the completely non-musical but quite entertaining Pocket Physics, but now I'm back on track. Pun intended. Want to hear what it sounds like? Some awesome tracks made with NitroTracker can be listened to on the download page. 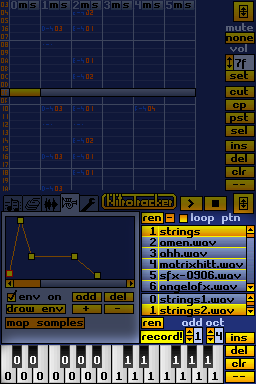 The documentation has been updated with new tutorials on editing samples and loops. 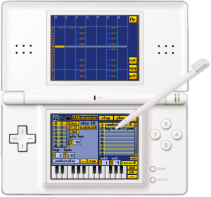 You can learn how to tune your instruments and apply volume envelopes and how to hook up the DS to MIDI. The NitroTracker beta testers have intensely tested this new release for months to ensure I didn't miss even a single bug. And they sure kept me busy! Thanks a lot you guys! If you want to join the fun, just drop me an e-mail! Today, the official NitroTracker Forum kindly hosted by the Mod Archive opens! No matter if you have questions, want to share your work, suggest new features or report bugs, this is the place. Also, NitroTracker now has it's own IRC channel! If you're up for a chat, just join #nitrotracker on Espernet! 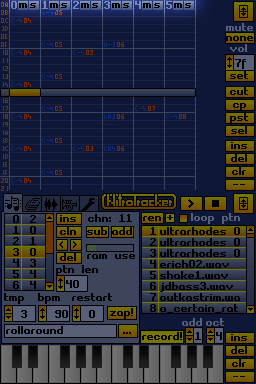 Yes, there's a mailing list where new releases of NitroTracker are announced. You can sign up here. v0.4 is the best NitroTracker in the world - ever! Up till now, I must add. Update 2: Added compatibility with the Max Media Dock / Player. Thanks to Zdm321 for testing! Update: I fixed some issues with SuperCard Lite and added compatibility for NinjaDS. People with these cards should re-download v0.3. 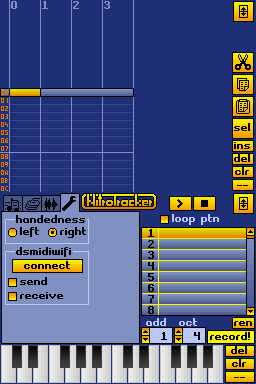 With DSMIDIWiFi, you can now use NitroTracker as a sequencer for your favorite music apps. 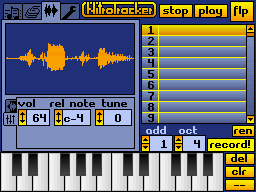 Also, NitroTracker can act as a MIDI synth itself, so you can use any MIDI sequencer to play back samples you record with the DS's microphone in real time! I also gave the interface and usability some polish and improved card compatibility. NitroTracker now supports DLDI, which means that you can easily add support for your card if it doesn't work out of the box. The song restart position can now be set. Shrinking the pattern cannot destroy data any more. If you accidentally make a pattern too small, you can just enlarge it again and your data is still there. Speed can now be adjusted while playing. The pattern can be switched while playing. The "clr" button is now on both screens. 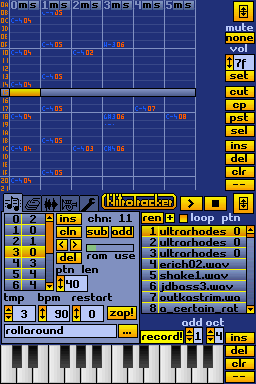 Relnote/finetune calculation for wavs works again. 8bit wavs are now loaded correctly without corruption. Stereo samples are now downsampled to mono. Fading no longer causes corruption on longer samples. "ins" is now 100% stable. Questions, suggestions, bug reports via the usual places. 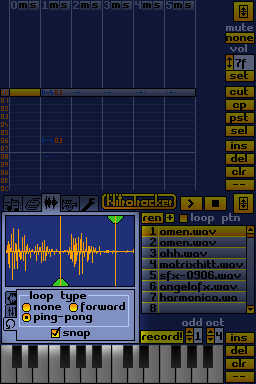 Finally, here's a new (major) version of NitroTracker featuring a sample editor for editing recorded/loaded samples with the stylus. Also you can now adjust volume, relative note and finetune. As always, if you have suggestions or comments, drop me a line to me@<thisdomain> or use the wiki or the gbadev-forum. So long, and have fun!